Germany will provide financial aid of Rs 720 crore to rebuild climate-resilient infrastructure in flood-ravaged Kerala. German Ambassador to India, Martin Ney said the loan would be provided at a nominal rate by the German Development Bank, KfW. The rate would be decided after expert discussions, said Ney, while adding that the aim was not just to rebuild Kerala but to make the new infrastructure climate-resilient. “In Germany, we have the expertise to build and maintain climate-resilient infrastructure. So, we will support Kerala financially to do the same,” the ambassador said. According to Ney, besides a reduced interest loan of Rs 720 crore to promote climate-resilient reconstruction of transport infrastructure, KfW will also provide a Rs 24 crore grant for international expertise in the field of climate-resilient infrastructure planning. “In 2019, we may also provide a Rs 80 crore support. However, the decision will be taken later,” the ambassador said adding that annual German aid to India is to the tune of 1 billion euros. The aid to be given for flood relief was agreed after talks with the Union government held just after the August floods in Kerala. Ney also stated that within the framework of Indo-German cooperation, the city of Kochi had been selected to receive particular support in order to become a “Smart City”. “Through KfW, Germany is financing a Rs 940 crore project to provide Kochi with an integrated water transport system. The Water Metro project involves 15 identified routes connecting 41 boat piers and 10 island communities in the 46 km route network,” he said. On Thursday, a High Level Committee of the Centre headed by Union Minister for Home, Rajnath Singh, approved an additional assistance of Rs 3,048 crore to Kerala. The Kerala government had sought Rs 4,700 crore as compensation from the Centre for the damage caused by the floods, which were termed as “the worst in a century”. At least 488 people died in the floods which hit 14 districts of the state. In September, a month after the floods, Kerala had submitted a memorandum to the Centre seeking Rs 4,800 crore for relief work. The memorandum included all the details about the loss of human life, property, infrastructure and damage to crops. Responding to this, a committee headed by the Union Home Secretary had cleared Rs 3,100 crore. The Rs 600 crore that was announced as an advance earlier was included in this amount. Following the flood, there was an offer of Rs 700 crore from the United Arab Emirates (UAE). However, it didn’t materialise. Besides the UAE, the emirate of Sharjah had also offered separate financial aid of Rs 4 crore. Qatar had offered Rs 35 crore and the Maldives had also offered some help. But the Indian government had decided to refuse any help to deal with the post-flood reconstruction and rehabilitation process. The Centre’s decision was questioned by Kerala Chief Minister Pinarayi Vijayan. 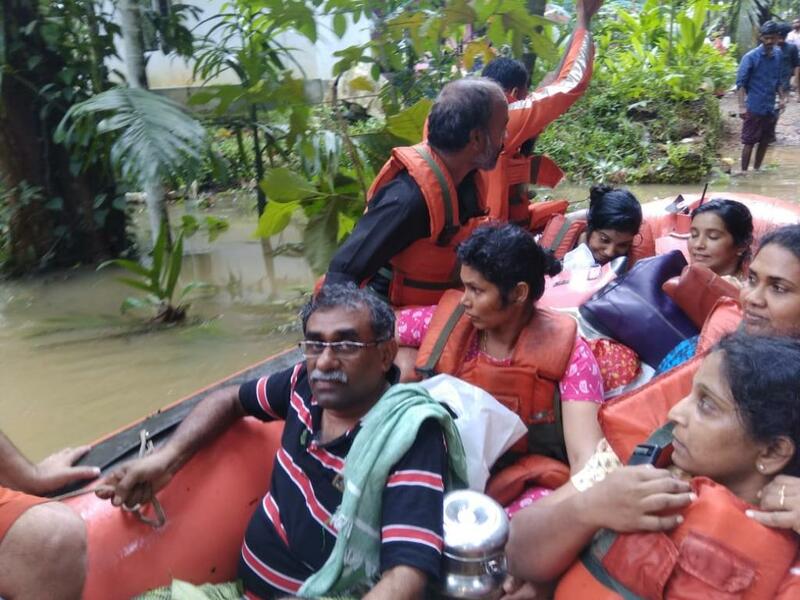 Recently, the United Nations (UN) Resident Coordinator in India, Yuri Afanasiev, presented the Post Disaster Needs Assessment (PDNA) Report to Vijayan, that assessed the damage and loss incurred due to the floods. According to the report, the state would need about Rs 31,000 crore for recovery and reconstruction. The highest amount would be needed for the reconstruction of roads and transportation (Rs 10,046 crore), followed by housing (Rs 5,443 crore), agriculture, fisheries and livestock (Rs 4,498 crore), employment and livelihood (Rs 3,896 crore), other infrastructure (Rs 2,446 crore), irrigation (Rs 1,483 crore) and water and sanitation (Rs 1,331 crore). The report highlighted international examples and models for building a better Kerala in 16 sectors. It suggested that Kerala could become the first green state in the country by building on the four pillars of integrated water resources management; eco-sensitive and risk informed approaches to land use and planning; inclusive and people centered approaches; and by adopting knowledge, innovation and technology. The PDNA is the global methodology developed by the UN, the World Bank and the European Union to assess damage and loss in the wake of disaster and to recommend recovery needs and strategies. In all, 76 experts from 10 UN agencies and the European Union across 13 sectors collaborated to develop the report in 20 days. The UN agencies included the UNDP, UNICEF, UNESCO, UN Women, UNFPA, UNEP, WHO, WFP, ILO and FAO and adopted reports of 3 sectors from the World Bank and the Asian Development Bank. Besides, two experts on integrated water resources management from the Netherlands also provided support. The report was prepared after visiting 120 villages in 10 districts and interacting with experts, affected people, elected representatives, officials and representatives of civil society organisations.